We were out enjoying the fall foliage in northeastern Paulding County, Georgia the other day and passed by a subdivision with home sites offering miles of spectacular views of the surrounding area. I posted an article on Celestial Breeze a few months ago and it appears that a different developer has moved forward on the property and it is showing signs of life. The name has changed to Celestial Ridge and is being developed by J. Bryan Homes and Gemini Properties. 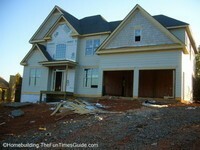 At the time I posted the article back in July of this year it was a subdivision in the making. Today…it’s a subdivision with new ownership and with homes in the making. I welcome you to see what a difference four months can make and possibly increase property values for this subdivision with a view. Celestial Ridge (formerly Celestial Breeze) has some of the best views I’ve seen in our area. Photos don’t do justice to the views of the multitude of beautiful fall foliage that can be seen from this ridge-top subdivision. This years colors have been especially nice. a) Build on a lot with one of the best views (in the neighborhood) of the surrounding area and not a view of the hardiplank siding of the home next door. b) Choose a floor plan that does a masterful job of taking full advantage of the views from as much of the house as possible utilizing plenty of windows (energy efficient, of course). c) Build an upper deck with an observatory for stargazing. Anyway, things seem to be moving forward on the property now and I just hope, for the new homeowners’ sake, that the builders will have some of the same things in mind that I do.